The Vileda Professional Supermop system is a hygienic alternative to conventional cotton mops, scientifically proven to inhibit bacterial growth. 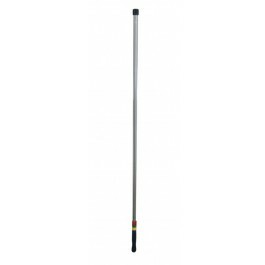 Ideal for spot mopping and all small area cleaning, including bars, washrooms, toilet cubicles, kitchens and corridors. The long handle is comfortable to use and easy to clean, manufactured from strong aluminium, which won't rust or chip with use, and features an interchangeable collar for colour coding. The handle features a selectable, interchangeable, collar available in Blue, Green, Red or Yellow. Colour coded, allowing the mops to be used as part of a coded cleaning system, suitable for use in hospitals, nursing homes and food factories. Suitable for use with Vileda Professional Supermop Heads and Vileda Professional Supermop Buckets. Full case pack size - 10 mop handles.